More food collected and meals served, less food wasted and fewer hungry stomachs in the Metro East, are items that Campus Kitchen at Southern Illinois University Edwardsville (CKSIUE) has on its menu for the academic year. 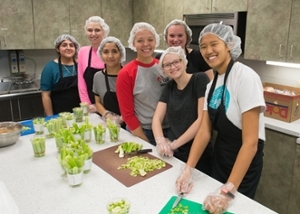 Campus Kitchen at SIUE opened for another year of community service on Wednesday, Sept. 6. Several student volunteers worked on cooking and preparing meals in the kitchen at the Student Fitness Center. “Campus Kitchen at SIUE is entering its fourth year of operation, and we hope to do more good in helping feed those in need,” said Melissa Bandy, graduate assistant for Community Engagement at the Kimmel Student Involvement Center. CKSIUE officially began operations on Sept. 10, 2014. CKSIUE collects food donations and then cooks and prepares meals from 2:30-5 p.m. each Wednesday, according to Bandy. The meals are then delivered from 4:45-6:45 that day. Each week, more than 80 hot meals will be delivered to the Community Care Center in Granite City. “Campus Kitchen at SIUE was the first organization I got involved in,” said Louisa Williams, CKSIUE shift leader and a senior majoring in speech pathology and Spanish. This is Williams’ third year working with CKSIUE. This sentiment was echoed several times by other student volunteers on CKSIUE’s first working day of the school year. To volunteer or for more information, please contact Bandy at mbandy@siue.edu. 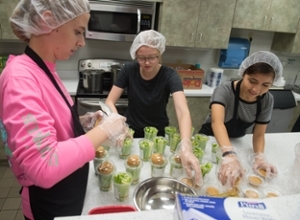 Founded in 2001, The Campus Kitchens Project is a national organization that empowers student volunteers to fight hunger and food waste in their community. On 58 university and high school campuses across the country, students transform unused food from dining halls, grocery stores, restaurants, and farmers’ markets into meals that are delivered to local agencies serving those in need. 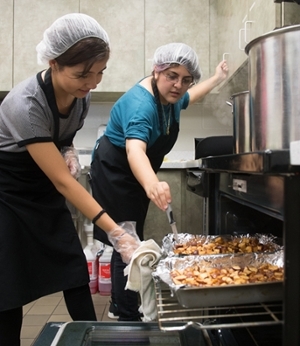 By taking the initiative to run a community kitchen, students develop entrepreneurial and leadership skills, along with a commitment to serve their community, that they will carry with them into future careers. Each Campus Kitchen goes beyond meals by using food as a tool to promote poverty solutions, implement garden initiatives, participate in nutrition education, and convene food policy events. Preparing celery snacks are Campus Kitchen at SIUE (CKSIUE) volunteers from left to right: Mackenzie Smith, Taylor Hoeg and Judy Bernal. Checking on food in the oven are Judy Bernal (left) and Monica Rodriguez. Volunteering on CKSIUE’s first day of preparation for the school year are (left to right) Monica Rodriguez, Mackenzie Smith, Judy Bernal, Louisa Williams, Taylor Hoeg (front), Melissa Brandy (back) and April Votrain.